I’m doing things a little differently. If you’ve visited before, you know that I when I host giveaways, I usually include my review and author interview all in one post. Today I’m separating them a bit. 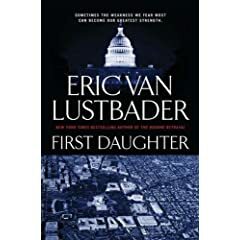 Below is my interview with Eric Van Lustbader- the author of the thriller “First Daughter“. Later in the week I’ll be posting my review of “First Daughter” and the giveaway details. However since the book is coming out now, I wanted to post my interview to generate a little buzz about it. But I can tell you now that you have a chance of winning a copy of this book by leaving a comment regarding my interview with author Eric Van Lustbader! So, a big welcome to Eric Van Lustbader! His new book is called “First Daughter” and I’m thrilled that he was able to answer a few questions for me! Q. I can see that this is far from being your first novel! With over twenty five books, including three Bourne books, how do you keep coming up with ideas and story lines? A. If I have a problem it’s that I have too many ideas to write them all! I’d like to finish my Pearl fantasy series, I’d like to write another Nicholas Linnear (“The Ninja“) novel, but I have other commitments now. Q. There have been a couple of movies released (the most recent starring Katie Holmes) called “First Daughter”. In addition, chick lit author Mitali Perkins has published books using the same title. Did any of these influence your decision when it came to picking a title for your book? A. To be honest, I don’t know about any of these. “First Daughter” was the perfect title for this novel. Q. Did you start writing “First Daughter” knowing exactly who the villains were, or did it come to you as you continued to write? A. Actually, the main villain began to write himself as I got further into the book. He was only fully fleshed out in the writing. This often happens with some of my best characters. Funny, that. Q. You ended “First Daughter” in a way that leaves it open for a sequel. Any chance that such a sequel is in the works? A. Absolutely. From the beginning, I conceived of Jack McClure have many, many adventures. The next one is already in my head, and very interesting it is, too. I’m hoping that as soon as I finish the next Jason Bourne book, due out next summer, I’ll be able to get back to Jack. Q. Let’s end with my usual bookish questions! What kind of books do you like to read? What is your favorite book? Who is your favorite author? Lastly, what are you reading now and why? A. Your readers might take a look at my Web site to see some of my favorite novels, but here are some current favorite authors: Roberto Bolano, Martin Amis, Don DeLillo, Laura Restrepo. “Cryptonomicon” by Neal Stephenson is simply astonishing. Right now, I’m reading “Theft” by an Australian writer named Peter Carey. A friend of mine recommended him. It’s about an artist and his brother. My wife and I have a good friend who’s an artist, so I thought it would be of particular interest. But the writer who has had the most powerful and lasting influence on me is Colin Wilson, especially his seminal work, “The Outsider,” in which I first began to recognize myself. There you have it folks. Thanks again to Eric Van Lustbader for stopping by! I’m already excited for the sequel, and I’m sure you will be too, once you’ve read “First Daughter“. As I mentioned above, my review of this book will be posted later this week along with more chances to win a copy of your own. For now, leave a comment on this post about my interview with Eric and you’ll be entered to win 🙂 Good luck. Edit: I never got around to my review…. it’s coming sometime. But I’ll be picking a winner on October 10, so you all have a few more days to enter. Seen my latest giveaway? 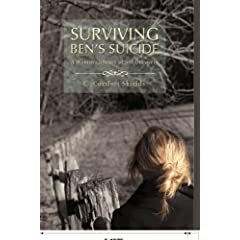 Enter for a chance to win “Surviving Ben’s Suicide“ by C. Comfort Shields! Only a few more days to do so! As for the writing, at times I was struck by the detailing. The excerpt above, for example, is strikingly beautiful. It reads like poetry. This is what creative writing teachers strive to bring of their students. It’s descriptive writing at it’s best. And there are many places throughout the book exactly like this. But it’s not just beautiful descriptive writing. It’s adventure… mystery…. intrigue…. danger…. and magic. And unlike the last book I read (my review for “Cruel Summer” is here) this is a book that is interesting and exciting for all ages- not just children or young adults. And as for me comparing it to Harry Potter, yes there are similarities. But I think that any new book about children and magic will end up being compared to HP. Reid’s book is certainly different in many ways, and unlike HP where I hated Hermione, in this book I absolutely adore Root. Shouldn’t that be the goal for authors? To have people like their characters? In this case, Reid succeeds, and I have no trouble recommending this book to others. Still not convinced? Check out the book’s trailer here. And stop by the book’s website, there are a bunch of fun things to do 🙂 But don’t forget to come back here! My interview with the author Kamilla Reid, and details on how to win a copy of the book are below! Kamilla Reid, the author of “The Questory of Karbunkulus: Item One: Miist”thankfully agreed to have a short interview with me. Welcome Kamilla, and thank you for spending some time with us. Q. I know that the title of your book is named after your main character. Can you tell us how you came up with that unique (and hard to type!) name? And what came first- the story or your character’s name? A. Y’know it’s funny, in one day, miraculously I heard the word used in both of its quite opposing definitions ( I know! What are the odds of that?) And I knew right then and there that that was to be her name. Of course I had to ‘K-ify’ it to make it uniquely hers. It still kinda freaks me out, the serendipity of it. And, though I do love the name I agree that it’s horrendous to spell. Q. In my review above I mention what comes to mind when I see this cover. Did you have any input in what the cover art would be and are you pleased with the final result? A. Being that I was the writer/director of a theatre company, I had immediate access to some pretty amazing talent. One being Matthew Brett, who was my set designer at the time. He was the perfect choice as illustrator, not just because of his abilities but because he and I already had a comfortable working relationship. So, I gave him the copy of the manuscript and from there we met regularly and honed the image to what you’ll see over at Book Cover Lovers. It was done in watercolor and is actually quite big, coming up to my waist! I remember we had a bit of a struggle with the green ribbon because, in the first one he did, the ribbon was too small to fit the title and, believe it or not he had to do the whole thing over again! But overall it was great fun and a thrill to watch it develop! Q. I was pleasantly surprised to see illustrations throughout the text. How was it working with your illustrator, Matthew Brett? I imagine that at times it could have been difficult to get your exact vision down on paper. A. Sometimes I’d give him the evil eye and say “You didn’t read that part, did you?” because it was so different from the description I’d given. But other times it worked to my advantage. For instance, my initial description of the Sea Wraith had a long, metallic type of mandible coming out from the hood. But Matthew drew something that looked like it actually inhabited the sea and I loved it so much better. Q. I’ve heard that there may be a second book in the works…? Can you tell us anything about that? I for one am looking forward to it! A. Oh yes, indeedy! There are five more books to come in the series, one for each successional item and each ending with the elimination of a team. So, in this first book, out of all those hundreds of teams, only six remain to compete for the next item (book 2). And of those, only five will advance to the next item (book 3), then four teams will race for item three (book 4) and so on until only two teams remain to go after the last item. Of course there is another, deeper, darker agenda going on and Root will learn the terrifying truth behind the mysterious items. She will also discover, to her horror that she is not a player in an innocent kid’s race but a pawn in a vicious adult game. Q. And like my other interviews, let’s finish with my usual final bookish questions! What kind of books do you like to read? What is your favorite book? Who is your favorite author? Finally, what are you reading now and why? A. It totally runs the gamut. Right now I’m reading my first YA romance, 13 Little Blue Envelopes by Maureen Johnson. Then I’m on to Coraline by Neil Gaiman (finally! ), The Mysterious Benedict Society by Trenton Lee Stewart and Making Money by Terry Pratchett. Woohoo! I loved Eat, Pray, Love by Elizabeth Gilbert and Love in the Time of Cholera by Gabriel García Márquez. I don’t think I could pick a favorite. There are way too many! I chose them all for different reasons, sometimes to see what’s out there in the teen world but mostly just to roll around in another’s sandbox for awhile. Thank you so very much for for granting me this time to share with you and your readers. It was a thrill and an absolute pleasure! A big thank you to Kamilla for stopping by! 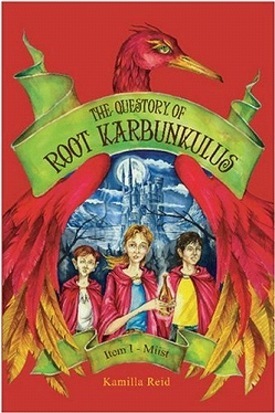 You can buy her book- “The Questory of Root Karbunkulus: Item One: Miist” here. If you’re interested in following her while she’s on her book blog tour, watch for her stops here. Don’t forget to watch the book’s trailer, and stop by the book’s website. ATTENTION: Kamilla and Blog Stop Tours graciously sent me prizes for one lucky commenter! That’s right, one winner will receive a copy of “The Questory of Root Karbunkulus: Item One: Miist”, a bookmark, and a dog-tags. Did I mention that the book is autographed? To enter, simply comment below and tell my why you want to read this book, AND something about Kamilla’s interview with me. The contest will end August 15th 12:00am EST. For an extra entry, blog about this contest and let me know about it. Good luck! Thanks to Kamilla Reid, and Dorothy from Authors on Tour. 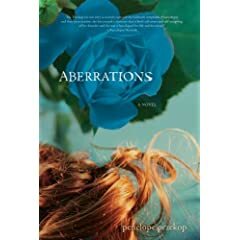 And if you haven’t already, read my review of “Aberrations” and check out my interview with Penelope here. Don’t forget to visit Penelope’s blog: Aberration Nation. “What do you really think about it?” I asked. “I’m not gonna judge,” she said, opening her car door. It was time to go. Every once in awhile, I think about a book’s cover art. Some are hideous, ugly, boring and bland. Then there are the beautiful ones. I found myself struck by this one. (Stephenie Meyer’s books also come to mind.) Of course once you’re impressed by the cover, you hope that the words inside are just as wonderful. (I’ve been disappointed in the past: see my review here for “Tantalize” by Cynthia Leitich-Smith.) But in this case, the book lived up to it’s cover. The blue flower is somewhat symbolic, and I just love the way the sun hits her hair. The story itself kept me hooked. As I mention below in my interview with Penelope Przekop, I’ve never read anything about narcolepsy. I only knew that it was some kind of sleep disorder, and Penelope was exactly right when she mentions that narcolepsy is usually used in some humorous way. The movie “Moulin Rouge” comes to mind. If you’ve seen it, then you know what I’m talking about. In “Aberrations”, Angel’s condition is far from being funny. She’s forced to take medication in order to keep her awake, but even with it, she lives a sort of ‘half life’. “Aberrations” isn’t solely about Angel and her narcolepsy, although I found that to be the most fascinating aspect of it. It’s also about life, death, family and friends. If there was anything that I disliked about this book, it was probably the Southern twang to the speech. That said, it doesn’t take anything away from the story, and if you’re a fan of Southern fiction, then you’ll probably have no problem at all. Would I recommend this book? Absolutely. See below for my interview and giveaway. Hello all, today I’m joined by Penelope Przekop. Her new book “Aberrations” will be released in a few days on July 1, 2008, and I eagerly welcomed the opportunity to interview her. Q. As I mention above in my review, I found the cover art to be very interesting. Were you involved, or did you have any input in the final design? A. Yes, I was able to brainstorm with the cover designer about initial ideas, images, and concepts. We were both focused on creating a unique and eye catching cover that would reflect the themes and tone of the novel. We both liked the idea of using some type of blue flower. It seemed unique and would reflect a specific scene in the novel as well as the aberrations of life we all must deal with in some form. As for the hair, we started out thinking about somehow incorporating a braid, which evolved into the hair on the cover. The designer suggested that a braid may influence folks to think of the book as a young adult novel, which was not the intent. The cover designer created numerous designs, which were circulated internally. I was able to see the top five covers, and provide my input. I was lucky because the cover I liked best was also their top choice. It was a fun process and I’m extremely pleased with the outcome. The designer loved Aberrations; she was dedicated to creating a beautiful cover that would inspire people to take a look. Q. Your main character, Angel, is narcoleptic. This is the first time I’ve read about someone with this disorder, and I found it an eye-opening experience. What inspired you to write about a woman with narcolepsy? A. When I began planning the novel ten years ago, I threw together several unrelated ideas and concepts that interested me, including narcolepsy. I have a degree in Biology and always found narcolepsy to be particularly interesting from a biological standpoint. I also recognized that the media had not accurately portrayed or fully explored the topic. Interestingly, ten years later, this is still the case. Narcolepsy continues to be commonly used as comedic relief. I suspected that it wasn’t actually funny for those who suffered from it, and thought it might be rewarding to tell their story. The more I learned about narcolepsy and rolled it around in my head, I realized it would be a fascinating and powerful avenue for character development. It is a great metaphor for how, at times, we’re all in jeopardy of sleeping through life. As I wrote the novel, Angel became incredibly real to me. I felt that if I could relate so intimately to her based on my own history, surely others might as well. Her struggle reflects many emotions that we all feel, and deal with, regardless of our specific aberration. I hope that it will help build more compassion and understanding of narcolepsy for readers, while providing some universally thought provoking messages about life that reach far beyond a specific medical condition. Q. I believe this is your first foray into writing fiction. Did you find it difficult to switch from nonfiction to fiction? A. Actually, fiction is my first love. I wrote another novel before Aberrations, which has yet to be published. I’ve always loved fiction. When I was five years old, I used to sleep with my favorite book, The Pokey Little Puppy. I stuck it under my pillow every night when I went to bed. I wrote my nonfiction book, Six Sigma for Business Excellence (McGraw-Hill) during the ten-year period I was writing Aberrations. At the time, I was asked to speak at an industry conference, and my editor at McGraw-Hill came across the conference brochure. I’d been plugging away on novels, trying to get an agent, a publisher, etc., for years, and out of the blue, McGraw-Hill calls to ask, “Have you ever thought of writing a book?” It felt like a miracle! So I put Aberrations aside to write the McGraw-Hill book. It took about a year. I was also finishing a Master’s Degree during that time, which I could not put aside. In addition to that, I was working full time as a Director at Johnson & Johnson, and raising a family. Needless to say, it was an extremely busy time. It worked out great because by the time I finished the McGraw-Hill book, I’d worked through how I wanted Aberrations to end. I’ve particularly enjoyed writing my blog, Aberration Nation, as it allows me to write non-fiction in the tone and voice I’ve developed while writing fiction. Business books don’t lend themselves to that quite as easily. Q. I enjoyed your unique beginning, with the definition of ‘Aberration’, as well as the newspaper clipping (which I also thought was a good way to end too). What made you decide to start and end like this? A. I’m one of those strange folks who actually spends time reading the dictionary; I’m a word freak. When coming up with the title for Aberrations, I scanned the Internet for a word related to photography that would miraculously relate to the underlying themes of the novel. I wasn’t sure if such a word existed, but in the end, I found it. The word aberration has several interesting definitions that are all a perfect fit for the novel. The first three definitions relate particularly well to Angel’s story, and to my own. I decided to include the definition simply because it was so fantastically perfect and I wasn’t sure readers would fully see the connection without having the definition. I used the beginning newspaper clipping to hopefully build some questions in readers’ minds. Once I’d finished the book, it seemed fitting to show them some of what had become of the characters through a subsequent news clipping. Q. Many authors find that as they write, the story goes in a different direction. Was this the case for you, or did you always plan for the story to go the way it did? A. I usually create my characters and the general plot before I begin writing. I also decide what themes I want to explore, the overall setting, and some of the settings for various scenes. The themes I choose come from ideas, emotions, or philosophical points that I want to explore and better understand rather than things I want to preach or instruct about. The aspects of life that I’m most sure of and confident about usually don’t creep into my writing. I also think about the format of the novel, which I believe is a creative element that’s underutilized in novels. Lastly, I choose symbols and recurring ideas that I want to weave into the story. As I sort through all this, the various elements eventually begin to connect in my head. Then I’m ready to write. With that said, I’ve only written two novels, but I’m now in this planning phase for a third. This process seems to work for me and so I plan to continue. As indicated above, for Aberrations, I didn’t have the ending figured out when I began. This eventually became a challenge for me, and I promised myself I wouldn’t do that again. I like the idea of creating all the various elements I mentioned above and weaving them into the story backwards and forwards, sideways, and upside down to create what feels like a self contained globe or a world rather than a linear experience. Q. And now just a few bookish questions! What kind of books do you like to read? What is your favorite book? Who is your favorite author? Finally, what are you reading now and why? A. I love to read a variety of books. This year I’ve read Alan Greenspan’s book, books on painting, numerous novels, and also biographies. I particularly love books that teach me about other cultures such as Snow Flower and the Secret Fan and A Thousand Splendid Suns. My all time favorite is The Scarlet Letter by Nathaniel Hawthorne. I read it as a teenager and couldn’t get past the writing style. Then I picked it up about twelve years ago and absolutely fell in love with it. My added maturity and my own life experiences enabled me to relate to it in a profound way. Its timeless relevance shocked me. Other favorites are Atlas Shrugged by Ayn Ran, Crime and Punishment by Dostoevsky, and Fight Club by Chuck Palahniuk. As you can tell, I love books that are entertaining but also thought provoking. This is the type of book I’ve always longed to write. I do enjoy purely entertaining books, and read many of those, but my ultimate desire is to read and write books that are highly meaningful and timeless. I’m just finishing The Thirteenth Tale by Diane Setterfield because it was chosen by my neighborhood book club. They’re planning to read Aberrations soon, which will be interesting! I included book club questions in the back of the book, so I invite book clubs everywhere to put it on their list! Well folks, there you have it! You can purchase “Aberrations” here. (Don’t forget to suggest it to your book club as your next read!) And if you want to know more about Penelope and “Aberrations“, visit her blog: ABERRATION NATION. ATTENTION: Penelope’s people have sent me an extra copy of this book to giveaway to a lucky commenter! (I’d give mine away, but I’m rather attatched to it lol.) Simply comment on this post telling me why you’d like to read this book, AND something about Penelope’s interview– make sure you do both ! (Don’t just say “Pick me please!” – those will be ignored. Make an effort!) Link to this post (and tell me about it) for a second entry. You have until 9:00 EST on 7/3 to do so, and I’ll randomly pick a winner that night. Thanks to Penelope Przekop and TJ Dietderich. But don’t just take my word for it! See Out of the Blue’s review here. Missed my last post? It was CONTESTS.